Technology is having a greater impact on the construction industry than ever before. With new applications emerging at a rapid pace, the way we plan, design and execute construction projects is continuously being disrupted. Virtual reality (VR) and augmented reality (AR) have both seen their fair amount of hype over the past few years, and they’re set to disrupt the construction industry even more in 2019. Many of the issues faced by architects, designers and engineers are linked to the inability to fully experience a project before completion. Although CAD and other modelling systems are beneficial during the pre-construction phase, faults related to design often materialize once the construction has begun. It’s the same when designing and erecting scaffolding solutions. Integrating VR into modelling systems will help detect flaws at the design stage, by allowing users to visualize and understand the real-life, true-to-scale environment. And, AR will also start to improve workflow and accuracy, by projecting designs on-site so structures can be created exactly as intended. It will also ease troubleshooting in the field. Some construction software developers have already recognised these benefits and are starting to include the technologies within their offerings. For instance, our BIM partner Autodesk, has teamed up with Unity Technologies to offer customers ‘one-click’ access to a 3D, virtual reality and augmented reality platform to enable users to visualize and correct design errors, with ease, from almost anywhere. In addition to issue detection, AR and VR will also benefit collaboration between construction project teams. For example, our clients will be to see 3D models of access solutions in project environments from the outset – something that is difficult to achieve with today’s 2D drawings and verbal/written plans. By bringing these to life, it opens the door for sharing ideas and making alterations during the pre-planning phase. Like we saw in 2018, one of the hottest technology trends for the construction industry for this year is Building Information Modelling (BIM). BIM is a way of creating and managing information on a construction project across the project lifecycle, outputting a digital description of every asset. Adoption of BIM is making project delivery more collaborative; allowing for sharing and versioning that paper drawing sets don’t. In fact, construction project owners recently cited better team coordination and delivery as the single greatest benefit of BIM to their projects, with tools reducing project error, time required for communication and increased client satisfaction. On top of this, BIM is enabling model-based cost estimation by automating the time-consuming task of quantifying and applying costs to designs. This is a key advantage of our new HAKI BIM software, which allows us to focus on higher value factors that play into our customers’ access solution designs. BIM also has a role to play in the visualization of designs during the pre-construction phase. As previously discussed in this blog, we expect to see more modelling tools begin to incorporate VR and AR during 2019 – including HAKI’s own. The most common construction robot for some time has arguably been the mechanical arm. HAKI has used these to manufacture the Universal system components in a state-of-the-art facility for years now, in a movement to ensure the highest-quality products for our customers. Moving forward, we’re likely to see these robotic arms being adopted away from factories and assembly lines, to carry out repetitive and labour-intensive activities on construction sites like moving materials and building masonry walls. Autonomous rovers are also likely to become more commonplace on construction sites. Equipped with HD cameras and sensors, the rovers will be able to navigate themselves round areas, carrying tools and materials for labourers. Rovers will also be used more for inspection and monitoring purposes in the coming year. Kier recently started trialling the robotic technology to automate on-site progress tracking and hazard monitoring, and AI robots like the Droxel LiDAR rover have been developed to help compare real-time progress with design models to ensure projects are progressing as designed. Drones have emerged as highly valuable commercial tools over the past couple of years, most notably in the construction industry. In fact, there’s been a 239% growth in drone use year-over-year in construction – a higher increase than any other commercial sector. They are already being used by surveyors and contractors for inspecting entire sites in just a matter of minutes; a task that used to take several weeks or months. For example, GallifordTry was able to conduct an initial analysis of a roof of an old school building through a set of high-resolution images captured by a drone, from the comfort of the office within no time at all. As we move into 2019, we can see drones being used on more sites to collect real-time data about ongoing projects, to understand what is happening during the construction phase from remote locations. Project managers will no longer need to consistently be on-site to monitor progress, and an aerial insight into a project will help with catching problems earlier on, to avoid delays and ultimately save money. 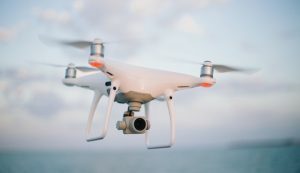 Furthermore, as drones become more precise, the more tasks they will be able to tackle for complex projects; so, we can expect to see the use of them on construction sites continue to skyrocket over the next year or so. HAKI also plans to start utilising drone technology within the next 12 months. Scans of buildings will be taken by drones to allow us to create 3D models and design scaffold structures to the exact requirements of a project. This service will be particularly beneficial to customers where an existing site drawing or model is not readily available. Watch the video here to find out more about how HAKI plans to use the latest technologies trends to enhance customer services.